99 Gallon(375L) hydraulic reservoir with 10 micron return filter. Maximum vertical reach is ground-level to boom tip height at maximum extension and angle with outriggers/stabilizers fully extended. The new 1400 is a 33-ton machine, a 10% increase in capacity over the Series 1300. The longest in its size range. The longer boom allows the operator to perform more lifts without the use of a jib, reducing setup time and improving efficiency. 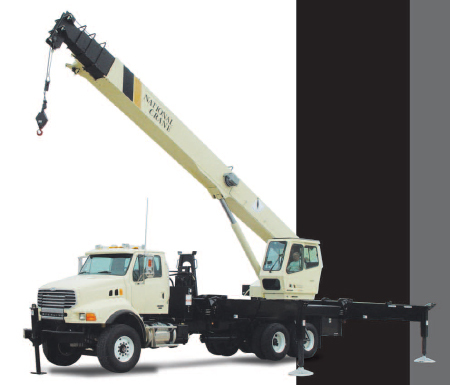 A 100-foot four-section boom or a 110-foot four-section boom is also available. Load Moment Indicator (LMI) standard on all series 1400 machines. LMI display and CPU are weatherproof. LCD display is visible in full or low light. All crane load lifting values are displayed simultaneously. The self-lubricating boom pads, standard on the 1400, reduce the conditions that cause boom chatter and vibration. The net result is smoother crane operation. This exclusive design, standard on the Series 1400, routes the wiring through the inside of the boom. No more snagging the wire on obstructions. Two sets of “H”-style outriggers with 24’ 6” (7.47 m) span, with removable ball and socket aluminum foot pads. Independent controls located on each side of the crane – can be positioned at mid-span setting of 17’ (5.18 m). The series 1400 is supplied with continuous rotation standard, along with the “glide swing” feature – allowing free swing during rotation – and a manually applied foot brake. 375° non-continuous rotation is also available. Standard on the 1400. A control knob located on the swing motor brake release valve can be easily adjusted to the crane operator’s swing speed preference. Radiator mounted at boom rest with electric fan is standard, with an option to deduct the cooler for low duty-cycle applications. The stronger standard torsion box improves rigidity, reduces truck frame flex and reduces the need for counterweight. These standard features simplify rigging changes by decreasing the time needed to change line reeving. Painting crane components before assembly reduces the possibility of rust, improves serviceability and enhances the appearance of the machine. Rigid galvannealed steel structure, well insulated, with ample safety glass for operator visibility and comfort. Multi-position seat with arm rest controls, ventilation fans, propane heater, wipers. Optional air-conditioning is available. Optional open-seat control station in lieu of enclosed cab is available. Bearings on the boom extend and retract cables can be greased through access holes in the boom side plates. Number of internal boom parts has been reduced, decreasing service time when rebuilding the machine. Provides smoother operation. The new design eliminates parts, reducing repair costs and improving the machine’s serviceability. National is number one in the production of commercial truck-mounted boom trucks. National has many programs and people directly and indirectly involved to provide our customers reliable products. National has the boom truck industry’s leading test program. Every structural part of the crane is cycle tested up to 60,000 cycles at full capacity. In addition to cycle testing, each model is subjected to state-of-the-art strain gauge testing that measures metal deformation as small as one one-millionth of an inch. The net result is that any weak areas are caught in test, not on job sites where costly downtime occurs. All outrigger, lift and telescoping cylinders are manufactured by National Crane, so that the seals, packing glands, and end plates are traced for accurate shipment of replacement parts. Parts are available for all National Crane machines, even if they are 35 years old. National has a formalized quality program and is ISO 9001 approved. You Expect National Crane to be a Quality Product That Will Provide Years of Service, and So Do We.